Hi, I am interested in your 1977 Pontiac Bonneville (stock #4811-CHA) listed on Autotrader for $13,995. I'd like to get more information about this vehicle and confirm its availability. 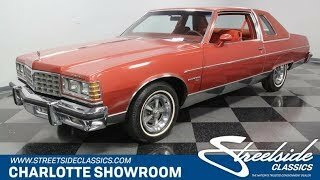 This big, beautiful 1977 Pontiac Bonneville Brougham is one of the best ways to be distinctive, yet unmistakably American - all in an affordable package. This survivor-grade coupe has everything you want from the 400ci V8 to cold A/C. This big coupe has big 70s style. It has Pontiacs cool Firethorn Red paint, and its is original to the car. Theres a nice balance of gloss and wear-in to instantly tell people this has been treated with care for over four decades. So its impressive even before you tell them the car has averaged less than 140 miles annually! Since Brougham is a true premium designation, this one really gets the classic opulence right. Thats why you have the rear fender skirts, full mirrored lower body panels, and a color-matched half vinyl roof. Its a total package thats complete, right down to Pontiacs Rallye II wheels. The handsome red interior complements the exterior color nicely. And such low mileage means little time to wear in the comfy velour. This red is also nicely matched on the door panels, headliner, carpeting, and three-spoke steering wheel. Because this is a full-size coupe, youve got room to bring up to five family and friends along with ease. Or you can fold down the middle armrest to give you a more individual luxury experience. No matter how many people are along for the ride, they will all do it in comfort. This came loaded from the factory with features such as a power seat, power windows, power locks, cruise control, and air conditioning. This is such a time capsule that even the AM/FM stereo with 8-track player is still cranking out the tunes. Pontiacs legendary 400 cubic-inch V8 has such an authentic appearance in the engine bay right down to the decals. So it should be no surprise that this survivor coupe still carries its original motor. Topped with a four-barrel carburetor, it has the kind of power that allows this Bonneville to live up to its effortless cruiser image. This is backed up by the three-speed automatic transmission, power steering, and front disc brakes for the ultimate easy driving classic. This Pontiac comes complete with the factory build sheet, original bill of sale, dealer invoice, owners manual, title docs, and maintenance records. Theres even the window sticker so you can see all the key original components that are still on the car. Now youll understand just how well this large coupe has been cared for over the years. You dont find cars that survive looking this good that are also this affordable. Thats why we know youre going to need to act fast to take this Pontiac home. Call now!